Is there anything better than seeing those little faces smile up at you? Well, yes actually—knowing that those smiles are healthy, too. After all, dentistry isn’t just for adults. Kids need good oral healthcare, as well. Dr. Deborah Romack and Dr. Garrett Mulkey have made children’s dentistry an integral part of their practice at Cosmetic & Family Dentistry in Weatherford, TX. When should you begin to care for your child’s teeth? The day that first little tooth erupts through the gum. We recommend brushing with a small, soft bristle toothbrush. There’s no need to use toothpaste; a little warm water will do. As your child grows, his or her smile will grow, too. To keep that adorable smile healthy, our dentists would like to see your child twice each year for checkups. 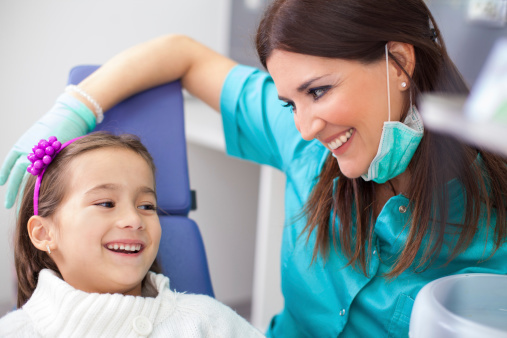 Just like you, your child needs regular teeth cleanings, assessments of their gum health and their bite, as well as examination for tooth decay. Yes, baby teeth can get cavities and it’s necessary to treat decay with proper fillings, because those baby teeth are important placeholders for permanent teeth. Once your child’s permanent teeth are in, our dentists will likely want to use fluoride treatments and dental sealants for added protection against cavities. Fluoride has been proven to strengthen teeth’s enamel, the first line of defense against decay-causing bacteria. Dental sealants are a thin plastic coating that is applied as a liquid to your child’s deeply grooved and pitted molars. Once hardened, sealants form a protective barrier against decay. In addition, Dr. Romack and Dr. Mulkey are especially interested in treating children who may not have room for their erupting permanent teeth, and we can work with children at an early age to address problems like sleep apnea, snoring, breathing difficulties, and teeth grinding. We also offer orthodontic treatment, making Cosmetic & Family Dentistry a one-stop shop for all of your children’s dental needs. If you child needs to see the dentist, then call the office of Cosmetic & Family Dentistry today. We serve patients in Weatherford, TX, as well as the surrounding communities of Aledo, Brock, Millsap, Springtown, Mineral Wells, and beyond.